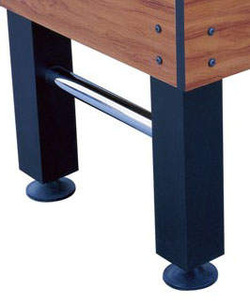 Legs can provide stability to a foosball table to prevent it from shifting during your game play. Always look at the thickness of the foosball table legs because you want to avoid tables with skinny legs that will make the table wobbly. Skinny table legs will also cause it to shake around during a game which can make it seem like your table isn't level. It will also be harder to set up a shot if your opponent is slightly jarring a table with skinny legs. Good quality tables will have legs that are 3.5 inches by 3.5 inches or larger in order to provide the stability you want. Some tables also have an added convenience of adjustable leg levelers at the bottom of the legs so you can easily level the foosball table. We also recommend getting a table with this feature because it is really hard to level legs without them and typically the nicer tables have adjustable legs. The flat leg design will be more time consuming and you will need to do more trial and error by adding the correct amount of shims under the legs in order to make the table level. Read our leveling a foosball table section to learn more about how to properly level your table.